The career of Pamela Bianco (1906-1994) spanned eight decades, encompassing her beginnings as a precocious child artist in Europe, through to her years in England and her subsequent move to the United States, where she developed into an American Modernist painter and printmaker who continued to exhibit into the 1970s. Her artistic friendships ranged from Ben Nicholson to Joseph Cornell, and a decade after she died in New York, England & Co held a retrospective exhibition of works from her estate in December 2005. 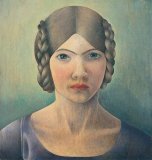 Bianco's Self-Portrait, featured here, is included in True to Life: British Realist Painting in the 1920s and 1930s at the Scottish National Gallery of Modern Art (Modern 2), Edinburgh, until 29 October 2017.